Green Industry marketing experts translate the results of PLANET/Harris Interactive’s consumer survey. 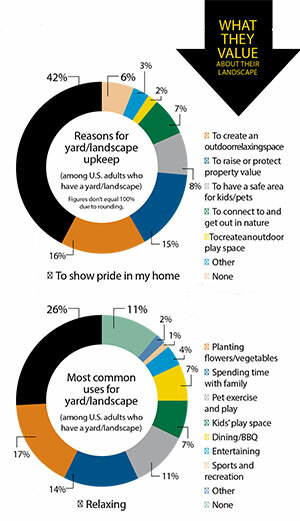 In December, Harris Interactive conducted an online survey on behalf of the Professional Landcare Network (PLANET) to discern homeowners’ landscape priorities. The study was conducted among more than 2,800 U.S. adults. To learn how some of the study’s results can be used by landscape professionals to improve their messaging, we tapped three Green Industry marketing pros to give us their take. Here’s how they broke it down. “These survey results are consistent with others that suggest the two most trusted sources of information for making buying decisions are the web (online search and reviews equal 44 percent) and recommendations of friends (referrals at 53 percent). While the recommendations of trusted influencers will always be powerful, the truth is people make choices based upon a number of criteria. We have access to data and opinions like never before, and we use that information from signage, print media, traditional websites and now social media to make better decisions. So, whether one first goes to a friend for a referral or starts by doing research online, the truth is people will use one to validate the other. Therefore, if your business has a thin online presence, the likelihood of those personal referrals holding up is nearly cut in half, according to the data from this survey. 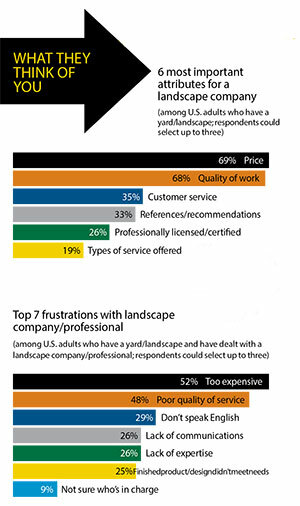 Professional landscape services are a significant investment, and consumers will seek businesses that measure up in multiple categories: trusted by friends, professional in their online appearance and, of course, active in their local communities, which is another measure of trust. “Research is one of the most valuable tools in business when designed, analyzed and leveraged correctly. Looking at this research, you see that price and quality of work are rated No. 1 and No. 2 for both questions. Therefore, in order to be successful you’ll need to market and sell value and risk, not price, since value is defined as benefits divided by price. What you want to communicate to customers is everything they’d lose by not buying from you (risk), and, conversely, everything they’ll gain by hiring you. You must clearly identify all of the benefits they’ll gain by using your products, services and team. Things that go a long way in communicating value and validating price include credentials, warranties and guarantees, sustainable practices and/or innovative payment plans. Sell opportunity not price. Quality of work issues can be handled by the presence of a reputable list of references, strong warranties, a checklist of daily site activities performed, a map or personal tour of completed work and/or by providing product samples. All employees should be in uniforms with your company name clearly visible. Also consider having an English-speaking account manager with 24/7 accessibility, regularly scheduled walk-throughs and an easy-to-use feedback mechanism. 1 Comment on "What consumers want"